Carbon dioxide systems are generally used for unmanned areas since it could be lethal for human beings though it is economical & one of the best agent for extinguishing the fire. Low pressure CO2 systems (360 psi) are used where the quantity of the gas required is high as it is available with tanks from 1 tonne to 10 tonnes & comes with its own refrigeration unit to store CO2 in its liquid form. High pressure CO2 systems (850 psi) are used where the quantity of gas required is small as they are available in standard bottles of 50, 75 & 100 lbs capacity wherein the gas is stored under high pressure at normal ambient temperature. Inergen systems are the evolution of new clean agent systems after the ban on Halon systems. It kills the fire by inerting the hazard with huge quantity of inert gas like Nitrogen. The initial fill & refill of gas is very economical though the storage cylinders & their maintenance might be an expensive affair. FM200 (trade name) is one of the most successful replacement of Halon systems where it is human friendly & not having the ozone depletion potential. It is stored under pressure of Nitrogen at about 360 psi. Sapphire/Novec is one of the new replacements for Halon systems which is again human friendly, zero ozone potential & no global warming. Easier to handle as it is in its liquid form at normal ambient temperature & flows easily as compared to FM200. 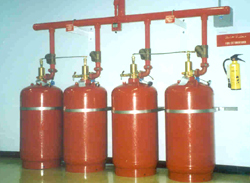 Designing of above mentioned gaseous fire protection systems needs highly skilled, competent & preferably factory trained personnel as they involve high tech equipment with high pressures & involves flow calculations on special software which are generally provided by the manufacturers. At Heba India we have the team with above qualification & who have the experience of designing, erecting & successfully commissioning, hundreds of such systems. We have the necessary software too for running the calculations.